Under-tile systems: Here, the coils are placed directly beneath the floor. As the coils are so close to the surface, these systems heat rooms slightly faster than other electric systems. But they are more fragile and susceptible to damage. This is an important consideration because if the coil gets damaged during installation, the entire cable will need to be replaced. 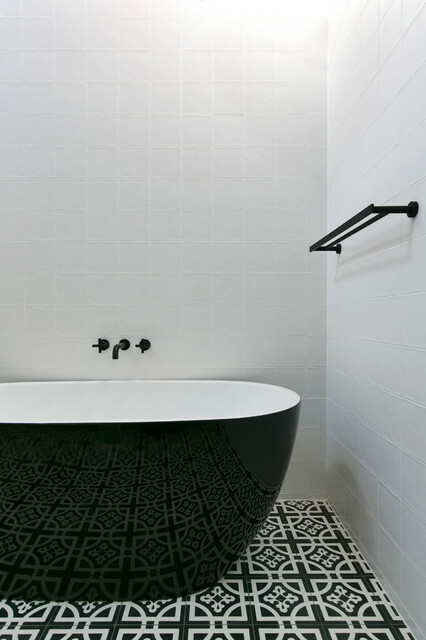 The black and white mediterranean tiles are a fun twist for a modern bathroom design, keeping the colour palette at a minimal allowing for flexibility. The stark contrast also adds a nice dramatic touch.